Mount the TEKTON 4 in. 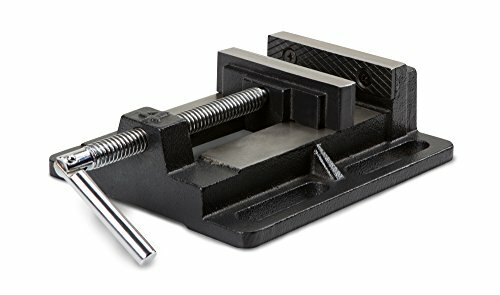 Drill Press Vise to your drill press table and get professional results with perfect hole placement every time. Whether it's a wood, metal, or plastic part, you can work better, faster and safer knowing it's properly secured and won't shift or twist. Made from 30,000 PSI cast iron, durability and dependability are built in. The sure grip of replaceable steel jaws is evenly distributed across workpiece surfaces, preventing slipping or crushing. Polished top surfaces are flat and true, to support workpiece and keep it square to drill bit travel. Large bolt-down slots for maximum mobility while re-positioning. Turn the chrome plated folding bar handle and the jaw glides smoothly along the Acme-threaded main screw without binding or chattering, even as clamping pressure increases. Mounting holes (4): 2-3/4 in.